Prior to SQL Server 2012, we were not allowed to take COPY_ONLY backups using the Maintenance Plans. We could use this option only with the Backup Database GUI or using T-SQL scripts. 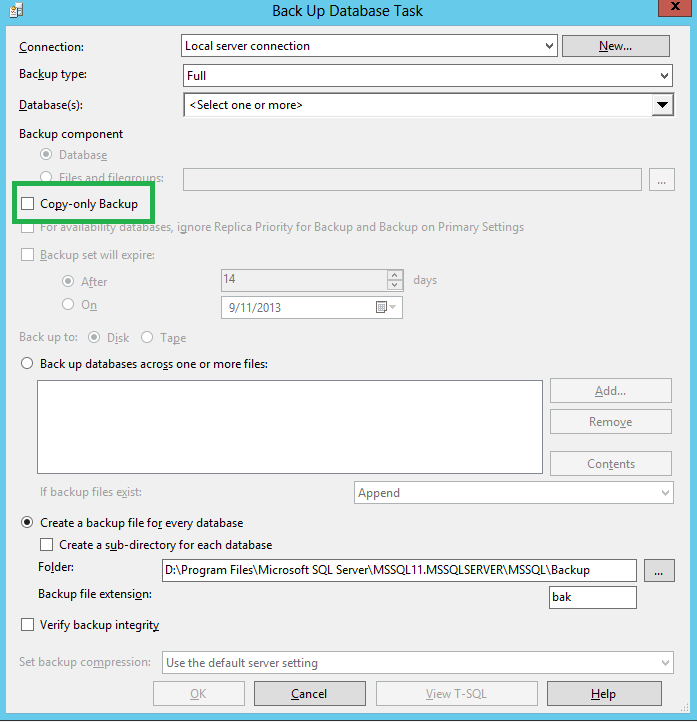 In SQL Server 2012, this is one of the new option that allows us to take COPY_ONLY backups using the Maintenance Plans. Consider a situation where you have multiple instances of SQL Server installed on a single server and each instance has multiple SSIS packages store within the msdb. Also we know that the SQL Server Integration services is not instance aware which means we cannot install more than one instance of SSIS on one server. Now the question is how can we manage SSIS packages stored on the different SQL Server instances? The Solution for this is very simple and can be achieved by modifying the SQL Server integration services configuration file to include the second instance. By default, the configuration file will include the SQL Server instance which was installed first and we have to add the additional SQL Server instances to this config file. The name of the config file is "MsDtsSrvr.ini.xml" and will be usually located at "C:\Program Files\Microsoft SQL Server\100\DTS\Binn" and for SQL Server 2005 at "C:\Program Files\Microsoft SQL Server\90\DTS\Binn"
Now for this file, I will add one more SQL Server instance so that I can manage SSIS packages from 2 SQL Server instance with a single instance of integration services. After modifying the file we need to restart the SQL Server integration server services in order to reflect the changes made. We all know that SQL Server Integration services is not cluster aware. This means that we cannot set the SQL Server Integration Services to failover automatically. But still in many situations we are required to have SSIS installed on a cluster and make it work when the database engine failover or failback. To achieve this, we have to install SSIS on all the nodes of the cluster. Okay, I have a 2 node cluster and I have installed SSIS on both the nodes. When we install the SSIS, the configuration file by default refers to "." which means local default instance. But in the clustered environment, we never install the database engine with the node name and hence when we try to open the Integration services it fails with the below error message. To fix this error, we have to modify the SSIS configuration file "MsDtsSrvr.ini.xml" to refer to the correct SQL Server Instance Name. This file will be usually located at "C:\Program Files\Microsoft SQL Server\100\DTS\Binn" and for SQL Server 2005 at "C:\Program Files\Microsoft SQL Server\90\DTS\Binn"
The subsystem failure is a common error which occurs when an SQL Server instance is migrated. When we do the migration, we usually miss to install the SQL Server binaries on the same location as it was in source. Because of this the SQL Server jobs which uses SSIS, powershell, etc... subsystems will fail. Here is a T-SQL query to find the last run status of all the scheduled jobs in SQL Server. This query will be handy when you are not able to access the "Job Activity Monitor"
Here is a T-SQL query to find the currently executing jobs. The output of this query will be the list of jobs that are currently running along with the number of seconds it is been running.